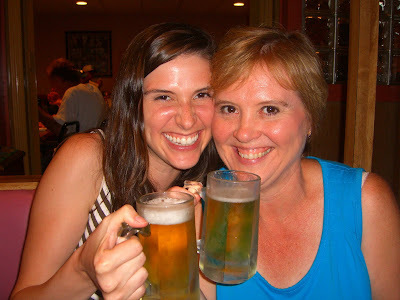 Just the other week, I spent some time in Ohio with my folks. The sun was shining, the farmers’ markets were overflowing with produce, my parents’ garden was brimming with veggies and herbs, the pizza was hot and the beer was cold. 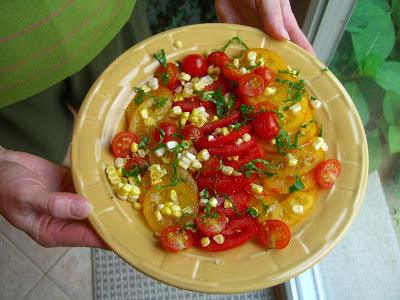 I thought I’d share with you some highlights of a few special Midwestern summer meals. 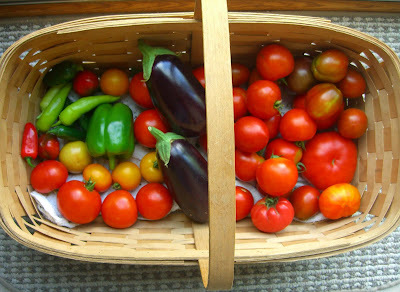 The tomatoes in the above basket were plucked from my parent’s garden, and were the star of the show throughout the week. They found themselves saucing silky eggplant gratins, piled atop cottage cheese and showered with coarsely-crushed peppercorns, wedged into sandwiches, and colorfully layered with basil and sweet raw corn. Speaking of corn. *sigh* Ohio corn-on-the-cob in August… OHIO CORN-ON-THE-COB IN AUGUST. Wow. It was so sweet, so tender and fresh that I nibbled it raw off the cob as soon as we got it home from the farmers’ market. The juices squirted unpredictably every which way with each bite. We had it for dinner that night, steamed for a few short minutes and lightly sprinkled with salt. 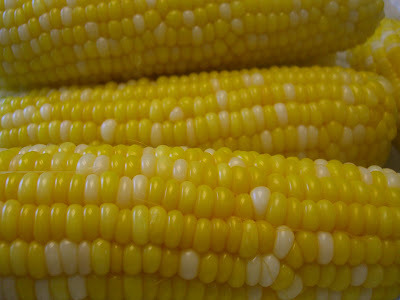 This ethereal corn was purchased from Angiuli’s market in Canfield. 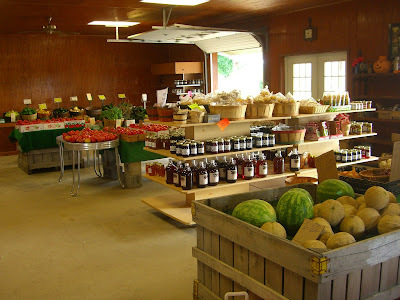 I’m sure they’d stay in business if they solely sold their corn, but they also have all sorts of produce, preserves, and dried Amish noodles. We also got some ripe figs. 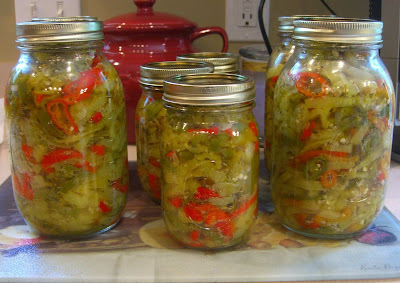 With all this abundance everywhere you look, my parents often can pickles and sauces and peppers this time of year. One of my favorites is my dad’s peppers. He infuses oil with garlic, softens spicy and mild peppers in the oil, and preserves them with in jars. They’re great on just about anything, and we had them on sandwiches and with pulled beef BBQ. 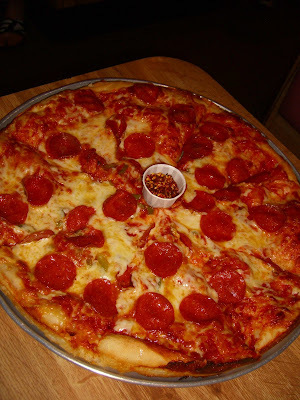 We wished we had tucked them in our purse when we went out for pizza at The Elmton in Struthers, one of my favorite pizza joints in the world with a pie that can only be improved by my daddy's peppers. I wrote about it here. The Plaza Bakery, also in Struthers, mostly sells cookies and cakes and turnovers and pastries and donuts, but if you get there early enough you just might get lucky and score a loaf of jalapeño bread. Luckily, my grandparents live just around the corner, and along with a box of pastries we picked up two loaves of the light and spicy bread. For the rest of the week, we made grilled sandwiches loaded with tomatoes from the backyard, Dad’s canned peppers, and melty cheese. The juicy tomatoes and garlicky oil from the peppers oozed out of the messy sandwiches, dripping down our arms all the way to our elbows. One night, we cooked thick slices of the bread on the grill to accompany our grilled summer veggies. 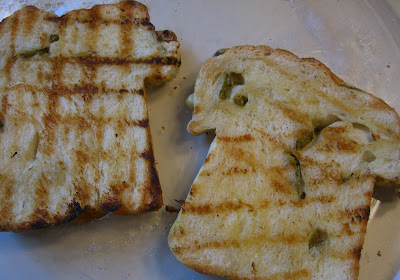 The jalapenos turned smoky, and the bread was chewy on the inside and crisp on the outside. Home-cooked meals weren’t the only highlights of the week. My mom and I met my aunt at Drake’s Landing one afternoon and enjoyed a fabulous and affordable lunch overlooking a marshy pond. 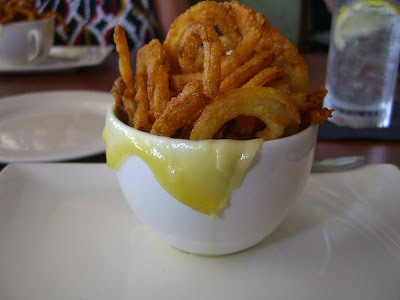 We each had French onion soup – with a twist. Not only did this soup have the traditional thick crouton topped with bubbly Gruyere, it was also topped with crispy fried onions. With unlimited bread and a bottomless salad bowl – all for only $5.99 – it was the best deal I’ve run across in awhile. This part of the country has some interesting and unique food traditions, like the Italian wedding soup I wrote about here. Another is what is simply called a chicken salad. 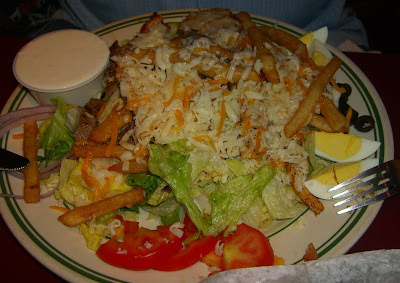 When I grew up, one of the only ways I would eat salad was topped with grilled chicken, grated mozzarella cheese, and hot French fries – topped with ranch dressing, of course. When I went off to Boston for college, I was shocked that none of my classmates had ever eaten a salad this way, and that I couldn’t find chicken salad a la Ohio on the menu of a single restaurant! On the way home from the Pittsburgh airport, my parents took me for dinner at Sal’s in Beaver Falls and my dad ordered a massive chicken salad. Salad greens topped with a marinated, char-broiled chicken breast, olives, tomatoes, red onions, cucumbers, hard-boiled eggs, two cheeses, and fries. Who said salads are for sissies? Love it! Can't beat a salad with fries on top. Miss you. Yeah, that's DEFINITELY where I get it from. i hate to say it but i really loved Al's for a long time. But not anymore. I adore pizza but there isn't a place here that can make a pizza like the one in your picture. Hmm, a post on my favorite pizza at the beach? there's an idea...and another 4 lbs. on my frame, doing the "research". Argh!